Times Literary Supplement: Shakespeare (Unfound(ed)? Katherine Duncan Jones offers a strongly argued dismissal of the recently publicised alleged portrait of Shakespeare. London Review of Books: “Is it Art?” Great article on video games as art by John Lanchester. François Ayroles: Nouveaux moments clés de l’histoire de la Bande Dessinée Brilliant, and hilarious, illustrations of a number of key moments in both North American and French comics of the last couple of decades. (Thanks, Dirk). Savage Critics: “The Politics of Smurfing”. Joe McCulloh on what is arguably the best of the Smurf stories, the classic King Smurf — or Le Schtroumpfissime — by Peyo and Yvan Delporte. Read this especially if you are unaware of the Smurf comics and how great they are. Daily Crosshatch: MOMEntum address by Eric Reynolds. 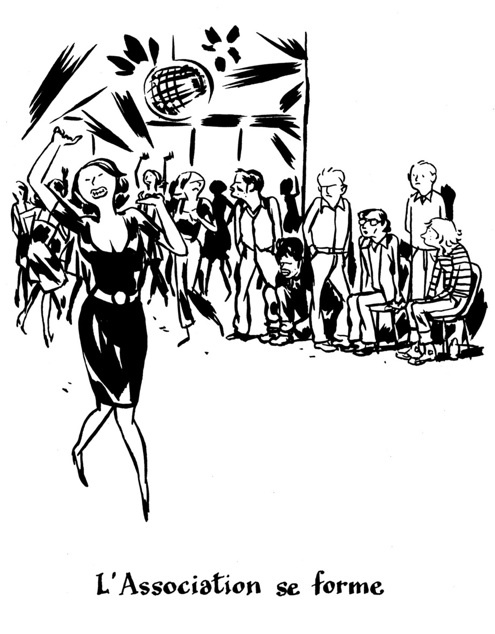 This is a bit old, but what the heck, it’s good: the head of marketing and publicity at Fantagraphics and co-editor of the Mome anthology offers his considerable insights on the development of the market for alternative comics. This is just another shameful plug: for the French-enabled readers around here, the modest du9 website has a very recent, and very friendly interview with Francois Ayroles, encountered during the last Angouleme Festival. Oh yeah, I forgot about that. You’ve been on a roll lately, what with your interviews with Frederik Peeters and Dan Clowes as well. Excellent work.